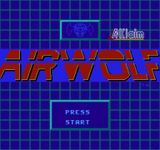 ``Airwolf is a multiplatform shooter video game based on the TV series of the same name. The game places the player in the cockpit of a helicopter (codenamed Airwolf), where the player must attempt to shoot down enemy aircraft and rescue prisoners. Source: Wikipedia, "Airwolf (video game)", available under the CC-BY-SA License.